While stock reports relate to a specific moment in time, flow reports cover a specified period of time. Say for instance the water in a reservoir. Now, the amount of water in the reservoir at a given moment of time is the quantity of stock. While the quantity of water that flows through this reservoir in a day’s time is the amount of flow. Thus, you can say that balance sheet is a stock report that indicates the resources and obligations of your entity at a specific moment in time. Income statement and cash flow statement on the other hand are flow reports. These reports demonstrate the activities of your business entity for a period of time, say a quarter or a year. Balance sheet is one of the fundamental financial statements prepared by your entity. It is a “snapshot” of your company’s financial position at the end of a specified date. Thus, a balance sheet informs the stakeholders of your company as to what it owns and owes to third parties on a specified date; usually the end of a year or quarter. Additionally, it states your entity’s liquidity position and its capitalization. As per statutory requirements, companies are required to file their balance sheets at least once a year. According to Resources and Claims View, assets are the economic resources of your entity as of the date of balance sheet. These resources provide benefits to your entity in future. The liabilities and owner’s equity, on the other hand, are claims against your entity. Liabilities refer to the amounts owed by your entity to outside parties such as banks, creditors, vendors etc. Whereas owner’s equity refers to the claims of the owners such as you. The second perspective with which a balance sheet is viewed is the ‘Sources and Use Of Funds’. Accordingly, the left hand side of the balance sheet indicates the funds utilized to acquire resources. Such investments are made in order to achieve your entity’s objectives, that is, earning profits. While the right hand side of the balance sheet indicates sources through which funds are raised. These funds are raised either from the trade creditors and lenders or the owners of an entity. The funds obtained from trade creditors are shown under accounts payable while funds from lenders appear as long term debt. Owners’ equity section shows the funds supplied by the you as the owner of the entity. This includes the paid in capital and retained earnings. This means every rupee invested in your entity’s assets is either provided by its owners or creditors. And every rupee supplied by entity’s owners and creditors is invested in some or the other asset. Since now you know how to interpret a balance sheet, lets try to get into its components. According to accounting equation, your business has to pay for whatever it owns (assets) by either obtaining funds from investors (owner’s equity) or borrowing money from lenders (liabilities). This brings you to the three major account categories of a balance sheet: Assets, Liabilities and Owner’s Equity. Assets are the economic resources that provide you benefits in future and are controlled by your entity. You can measure these resources objectively at the time of their acquisition. Further, you can group assets into current assets and non-current assets. Non Current assets are tangible assets that are particularly long-lived. These are the assets that you acquire to produce goods and services that will generate income for your entity in future. Such assets include land, building and plant and machinery. Besides these fixed assets, there are other assets in the form of long term investments and intangible assets. Liabilities are claims of your lenders, creditors and equity owners against your entity’s assets. These are the obligations of your entity to either transfer assets or provide services to the outside parties. Such obligations arise from the events that have occurred in the past. Now, liabilities are further grouped into current liabilities and Other Liabilities. Liabilities that do not meet the criteria for current liabilities fall under Other Liabilities head. All non-current liabilities such as long-term debt come under other liabilities. The third head in balance sheet is the owner’s equity or capital. This section represents the amount that investors have invested in your firm. The owner’s equity is further divided into paid-in capital and retained earnings. Thus, an increase in income or earnings of your entity leads to an increase in owner’s equity. While a decrease in earnings of your firm leads to a decrease in owner’s equity. 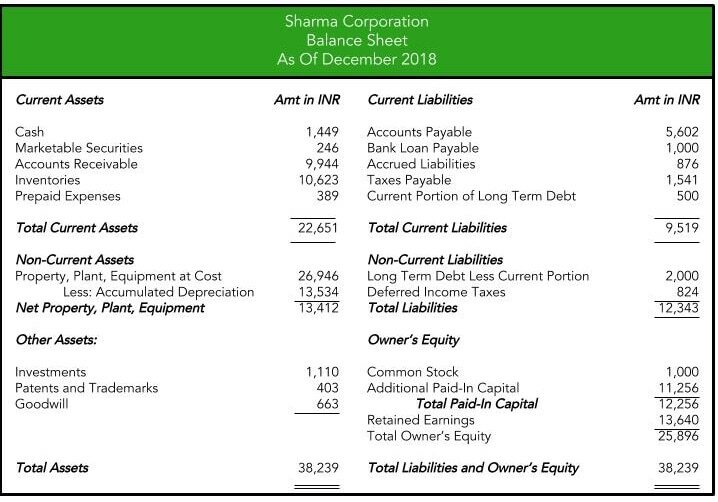 Following is the balance sheet of Sharma Corporation as of December 2018.